Resolve to keep fit the Cornish way in 2018 with active outdoor activities. Resolve to keep fit the Cornish way in 2018! Keeping fit doesn’t have to be a form of drudgery…with so many activities available nowadays it’s a wonder making time for exercise can sometimes be so difficult. So where better to kick start your New Year’s resolve to keep fit than the not-so-gently undulating gradients that make up Cornwall?! With miles of beach and hills a-plenty this special little county is the ideal destination to get outdoors and get those endorphins pumping! Take a look at these tips on how to improve your fitness and book a fun packed holiday in Cornwall. The Camel Trail runs along a disused railway line that follows the course of the Camel Estuary, providing access to some of North Cornwall’s most beautiful scenery and wildlife. The trail is level and traffic free making it an ideal day out for all the family. There are plenty of places to stop for refreshments along the way and Wadebridge is a handy half way point to try a Pasty! 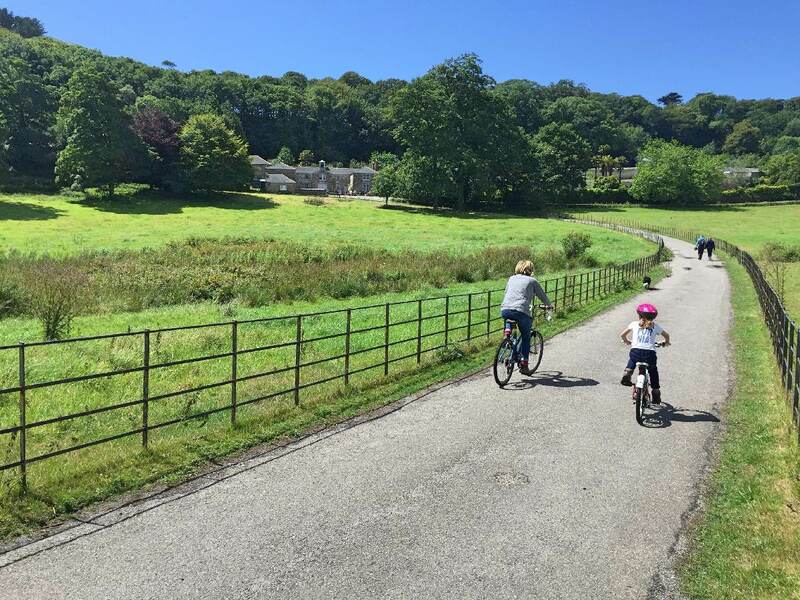 Bike Hire is available at various points along the trail; Camel Trail Cycle Hire is the largest and is located in Padstow – make a day of it and hit the shops after your rewarding bike ride! If you’re already an avid cyclist then the Bissoe Trail from Devoran to Portreath is slightly more challenging. The trail runs through the rich mining area of Cornwall’s central mining district and benefits from a 60km network of multi activity trails. Hire your bike through Bike Chain Bissoe, which also has a lovely little cafe where refreshments can be enjoyed after a hard day’s cycle. Work from the bottom, up! Outdoor activity centre and charity BF Adventure, based just outside Falmouth, offers a wide range of exciting and inspiring outdoor activities whatever the weather. The 60 acre site including 3 water-filled quarries is the ideal environment to try something new, challenge yourself and have a great time. Go coasteering, climb the quarry and work muscles you never knew you had! Boasting miles of world-class beaches and a stunning rural interior: Cornwall is breathtakingly beautiful. Picture palm-fringed sands, crystalline waters and a dramatically rugged coastline for some seriously special swimming spots, along with a handpicked variety of locations in which to enjoy a truly memorable stay. From tranquil creeks and historic harbours to wide expanses of windswept, dune-flanked golden beaches, Cornwall’s diversity of waterscapes offer a series of unique places to swim that will suit a range of agendas and abilities. Experience the wonder of St Michaels Mount from the sea, explore secret coves near Lands End and the thrill of the surf at Newquay’s famous Fistral Beach. Helford Passage – There aren’t many better ways to spend a lazy day walking than taking in the Helford River. This famous unspoilt estuary stretches from its rocky entrance on the edge of Falmouth Bay to the old port of Gweek at the river’s head. Around the river you can enjoy a series of achievable short walks that link up with sub-tropical gardens, a sprinkling of waterside pubs, quirky galleries, stunning unspoilt scenery and the iconic Frenchman’s Creek, made famous by Daphne du Maurier’s classic novel. Newlyn to Penzance – The seafront promenade at Newlyn makes for a lovely stroll, and both the lido and the art gallery (newlynartgallery.co.uk) are well worth a visit. This part of Mount’s Bay affords great views back across to St Michael’s Mount. Crantock & Penpol Creek – A short walk offering beautiful views over a tranquil estuary and the sweeping Atlantic coast, as well as the chance to explore the pretty coastal village of Crantock. Forever Cornwall has a wonderful selection of properties to chose from, many of which benefit from being close to the above listed activities. There’s no better time to tick off that resolution on the list – book your 2018 holiday today and look forward to your active holiday in Cornwall!